The CIA's Declassified History of the Glomar Explorer. For the first time, the Central Intelligence Agency (CIA) has declassified substantive information on one of its most secret and sensitive schemes, "Project Azorian," the Agency codename for its ambitious plan to raise a sunken Soviet submarine from the floor of the Pacific Ocean in order to retrieve its secrets. Today the National Security Archive publishes "Project Azorian: The Story of the Hughes Glomar Explorer," a 50-page article from the fall 1985 edition of the Agency's in-house journal Studies in Intelligence. Written by a participant in the operation whose identity remains classified, the article discusses the conception and planning of the retrieval effort and the creation of a special ship, the Glomar Explorer, which raised portions of the submarine in August 1974. The National Security Archive had submitted a Freedom of Information Act (FOIA) request to the CIA for the document on December 12, 2007. 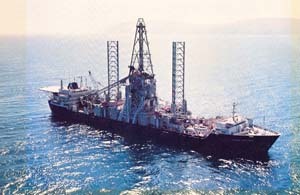 National Security Archive director Tom Blanton commented that "the Navy alternative to the Glomar Explorer--investigation by a deep sea submersible--sounds more convincing than the claim in the Studies in Intelligence article that Project Azorian advanced the cutting edge of deep sea exploration the way the CIA did on aerial and satellite reconnaissance. To me, Glomar resembles the Bay of Pigs more than U-2 or Corona. On the latter, they brought in the best people, Ed Land and the Skunk Works, on the former, they only talked to themselves." Also published today for the first time are recently declassified White House memoranda of conversations from 1975 which recount the reactions of President Ford and cabinet members to ongoing news of press leaks about the Glomar Explorer, including Seymour Hersh's exposé in The New York Times on March 19, 1975.